The New Orleans Funeral Jazz Band works on two fundamental principals. Mourning and celebration. The funeral starts with the mourning of the deceased. It is the sending off of a loved one through the medium of song. Slow, old fashioned hymns like Just a Closer Walk With Thee and the Old Rugged Cross. Once the deceased has been cremated or buried, it is time to celebrate. Usually a life well lived. At this point we play songs like When The Saints Go Marching In, Didn’t He Ramble and After You’ve Gone. Our New Orleans Funeral Jazz Band is London based. We also travel country wide, utilising talented local musicians whenever possible. This keeps travel expenses down. The jazz band was put together ten years ago in response to requests for a traditional New Orleans style funeral. Over the years many clients have referenced the old James Bond Film, Live and Let Die. The film started with a New Orleans Jazz Band playing the deceased and the mourners through the streets. We suspect that many of the deceased who have requested a New Orleans Funeral Jazz Band first saw their first funeral jazz band when watching this film! ”The New Orleans Funeral Jazz Band gave my brother (aged 87 years) the best send off ever imagined at his funeral celebration yesterday. Jeff’s Band arrived well before time, met immediate family and played before, during and after the service. If you want to celebrate the passing of a loved one with a New Orleans Jazz Band we are more experienced than most. We are here to guide you through the process. Do you want the band to meet at the deceased’s house and walk the cortege down the road? A sort of New Orleans Jazz Band Funeral Procession, in fact, just like a New Orleans Brass Band. Then meet up at the cemetery gates and take everyone up and in to the chapel? Whilst everyone is in the chapel, we normally wait until everyone comes out of the service and strike up with a happy song. Alternatively we can participate in the service with a hymn or two and maybe a tune whilst people reflect. We also the option of playing for an hour at the wake. This might be at a local hotel or pub where the mourners, the cortege and the friends of the deceased deceased, talk about their friend who has passed away, relate stories and generally help lighten the mood. Contact us here for a quote, or phone us on the number at the top of our home page here. New Orleans Funeral Jazz Band. Funeral Music. We normally recommend four up to six musicians depending on the number of people expected to attend the funeral. We can either choose music that is suitable for church goers or secular music. People’s taste comes in all shapes and sizes. The New Orleans Funeral Jazz Band is happy to oblige all denominations and non denominational types too. 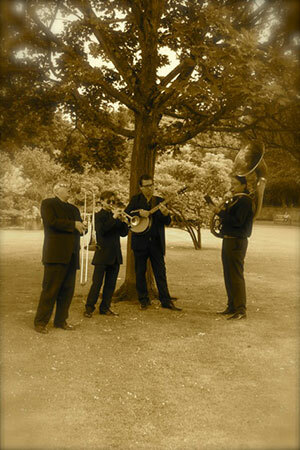 New Orleans Street Band Funeral UK wide and funeral jazz band hire for all concerned! As discussed New Orleans Funeral Music can be broken down in to two parts: The mourning and the celebration. Whilst NewOrleans Funerals have certain traditions in the repertoire played, we have no problem playing tunes outside this tradition. In the past we have been asked to perform Tony Bennet songs, Sinatra songs, tunes from the Godfather, even country and western music! 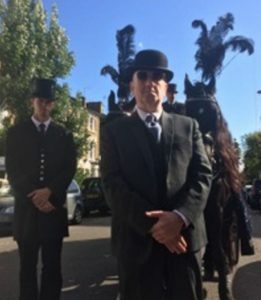 What is important to us is that you are able to personalise the experience for the deceased and the mourners, so songs important to the people involved are utilised in the ceremony. Here in London, we have a sizeable West Indian Community. On many occasions we have played for West Indian Funerals. In this time we have gained enormous experience in working with the West Indian tradition of burying the deceased. 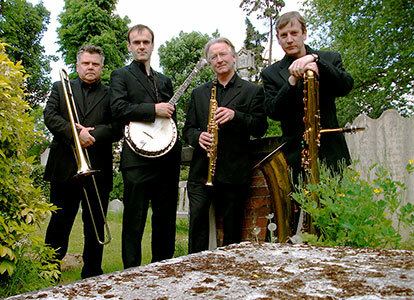 During this time, whilst family friends and family take turns to put their loved one to rest by using a shovel to fill in the grave, our New Orleans Band can play traditional Hymns. We get asked for hymns like “Onward Christian Soldiers” “The Lord is my Shepherd” “How Great Thou Art” as well as songs such as “Jamaican Farewell”. You can get live London jazz band hire here, or for other parts of the country as well. The band is more than willing to travel, as explained in our F.A.Q’s. More info on our jazz band hire page. And here is a fantastic website explaining the funeral from the New Orleans perspective. Funeral Jazz Band Hire for everyone. Here are details for an excellent Funeral Celebrant, Jay Belshaw.